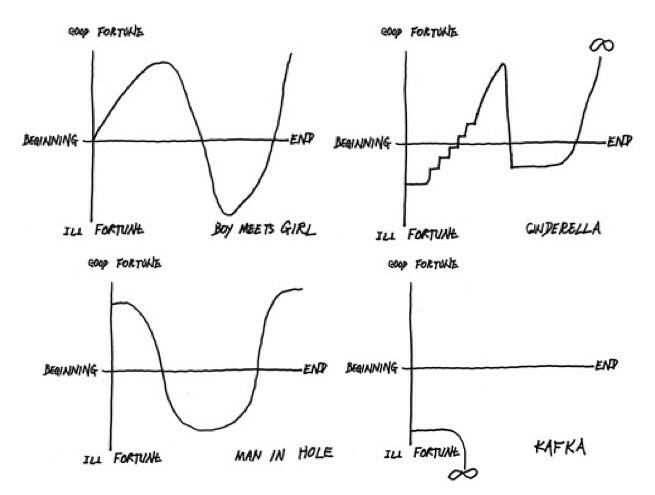 I always laugh when I look at that Kafka graph: Things are really crappy, and they just get crappier and crappier. Forever. It’s an amazing thing that we can laugh at the Kafka graph. I guess this trait is what keeps us sane in our dark hours, when we worry we might be living in a Kafka story. But this article is not about a Kafka story. It’s a Cinderella story, or at least: it’s got the makings of a Cinderella story. I hope it’s a Cinderella story. Maybe Kafka stories exist to inspire us to try to do what we can to build Cinderella stories. To do what we can to build for ourselves, and for future generations a Cinderella story. I want to talk about the Internet, or more precisely, the Web, and more precisely than that, the Open Web. I’m going to talk about my personal experience of discovering the power of the Open Web, some of the things I’ve been inspired by, some of the things I’ve helped to do, some dark days I have gone through as the Web as I knew it seemed to lose its way, and talk about why I think the Open Education movement might help keep the carriage from turning into a pumpkin. In 2001 I lived in New York. I was working for a brokerage/trading house, building and marketing financial products to finance greenhouse gas emission reduction projects. The idea, coming out of an international agreement called the Kyoto Protocol, was that big CO2 emitting companies could pay for projects in other companies and countries to reduce greenhouse gas emissions. This wasn’t law at the time (and still isn’t in most places), but there was a chance it could become law, and we were marketing this idea to big companies as a hedge against the possibility of the Kyoto Protocol getting ratified in the USA, and emissions caps coming into force. I believed (and still do) that climate change was the biggest threat facing humanity, and that finding ways within the system to incentivize greenhouse gas reductions was our best chance to change things, while we waited for governments to implement clear laws capping C02 emissions. (We are still waiting, 15 years later, no matter what they tell you about the recent talks in Paris). 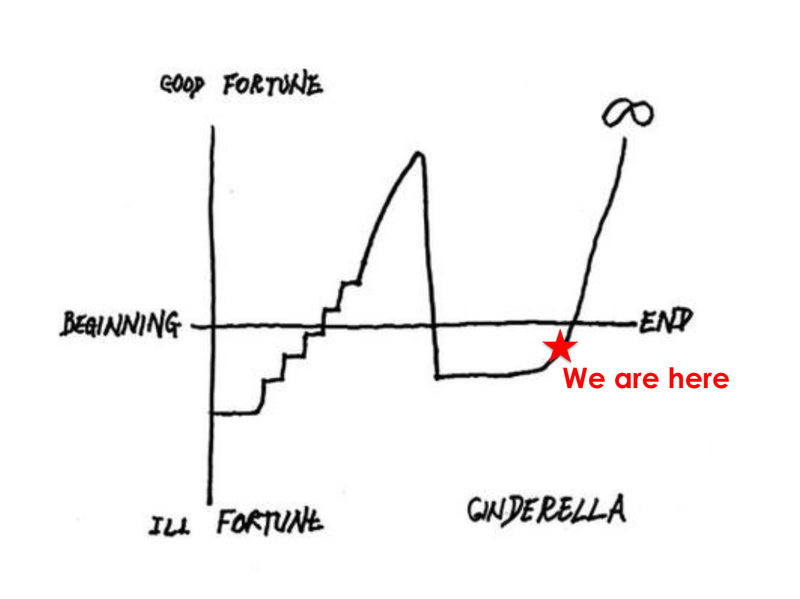 In 2001, though, we were optimistic. My colleagues and I believed that real legislation was on the way: George W. Bush, a Republican ex-governor from an oil-rich state, had actually run on a platform that included CO2 reduction in 2001 (Yes! It’s true!). And it seemed like hard-nosed Republicans might be better at getting such laws through the American system than the Democrats. That was the theory anyway. Sometime in the summer of 2001, I went to South Africa to meet companies who might have big emissions reduction projects that we wanted to help finance. One of the companies I went to see was the energy and chemicals giant, Sasol. The chairman of Sasol was a big, gruff old-school Afrikaner. He had a huge bald head, ringed with close-cropped white hair, a red sweaty face. He glowered silently while my colleague and I explained what we were doing in South Africa, how George Bush had campaigned on carbon reduction, and how the Kyoto Protocol would (likely) enable big American companies to finance carbon reduction projects in Africa, to help them meet their emission reduction targets back home. I spent a few more months in that job, getting nowhere. The people we were talking to — in industry, in government — were generally concerned about climate change, they were sure that there would be legislation eventually. But it became clear that the scale of these interlocked systems — energy, economy, politics — was just so huge, with so many competing forces at play. Changing big systems like that is almost impossible, absent immediate catastrophe. On September 11, 2001, I was living in a 5th floor walk-up on East 11th Street in New York. My bedroom window faced south, with a beautiful view of the Twin Towers. I woke up that morning to glorious sunshine, the towers vivid with a bright blue sky backdrop. I left for work a little later than normal. I was walking to the subway when I got a call from a colleague on my cell phone: an airplane had hit the World Trade Center, and it was unlikely that I could get to work. The subways would be closed. I imagined that a two-seater, flown by an inexperienced pilot who lost control, or a small-time crazy, had hit the building. I had no idea what had really happened, what was really happening. At 9:03 a.m. a second plane hit the south tower. The people of New York were out in the streets, talking on their cell phones, talking to each other. We were sharing the bits of information we could get with strangers. We were somewhere near Washington Square Park when we understood that this wasn’t the work of a small-time crazy. We kept waking south, watching as smoke poured out of the Towers into the crystal blue of the sky. We made it to Wooster and Grand, about 20 blocks north of the Twin Towers. Dozens of people were in the street with us, watching the smoking building in disbelief. Someone had put a TV in a street-level window, tuned in to the live news coverage. I was watching the TV as a plume of smoke shot out of the north tower. I instinctively turned from the TV, and watched the Towers; I knew this wasn’t good. 9:59 a.m. A deep rumble, like a giant zipper, shook through the air, and the building just collapsed down on itself, in a cloud of dust and smoke. A woman beside me screamed: “Oh, all those people!” And fainted. A man beside her caught her before she fell to the ground. A minute or so later, the dust and smoke cleared from the sky. One tower stood where before there were two. The climate change division of my company was shut down shortly after that, and I decided, like many of the expats I knew in NYC at the time, to head home, back to friends and family, to re-evaluate our lives and what we were doing with them. When in Doubt, Read. And Write. When you experience something like 9/11, you question much about your life: the decisions you’ve made, the compromises you’ve made, your future, what you want to do before you die, as you might, any day, any moment. What you want to be remembered for doing if you do die. Retreating home after September 11, what I wanted to do was write and read. After September 11, climate change disappeared almost completely from the public discourse. Instead, in the post-September 11 era, the full weight media frenzy and the U.S. policy machine was brought to bear on a different risk, a different war: the war on terror, and shortly thereafter the war in Iraq. So: no one was going to do anything about climate change; I’d watched 3,500 people die in the Twin Towers; and the West was hellbent on marching off to a dubiously justified war in Iraq. There was nothing I, or anyone, could do about any of it. It felt a lot like a Kafka story. 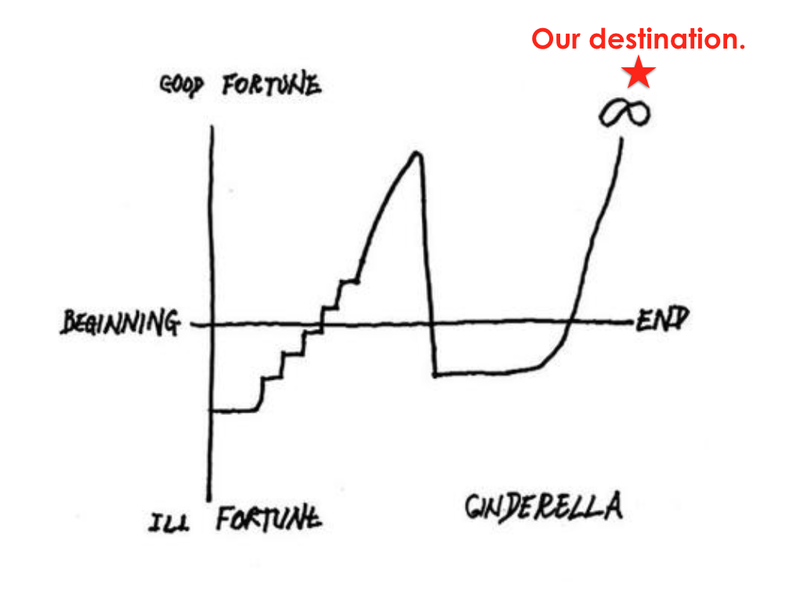 But Cinderella will be our guide. 1. (2004) Everything Is Terrible, But What Is This Free/Open Movement? Over the next few months, I spent a lot of time reading about how terrible everything was. New sources of alternative journalist started popping up, particularly on the Web, with non-mainstream political writing. I consumed the news in unhealthy levels. 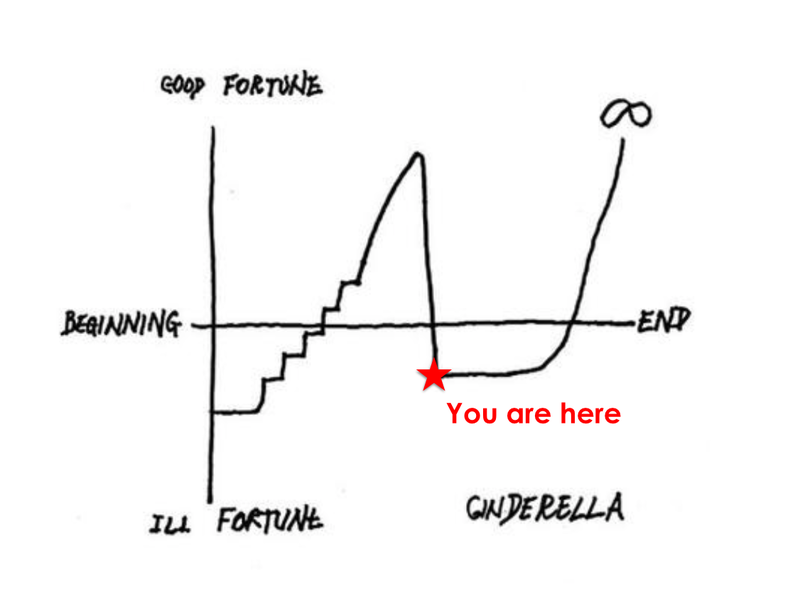 Things were bad, and it wasn’t clear how things might get better. But somewhere in my readings, I discovered the Free/Open Source Software movement, and I saw a glimmer. Hope Springs: Free/Open Source Software Movement. By the early 2000s, Free/Open Source Software was running a huge part of the infrastructure of the Web (particularly the Linux operating system and the Apache file server), and it was starting to leak into consumer-facing software, such as the Firefox Web browser, and the WordPress blogging engine, which was released in 2003. The thing that struck me about the Free Software movement, as I read more about it, was its Aikido-like approach to the problem of fighting powerful, incumbent systems. The Free Software movement didn’t try to change a big proprietary software scheme. Changing big systems — like climate change policy, like foreign policy, like successful commercial publishing models — is very difficult. Coupled with the newly emerging ease of communicating on the Web, well, it seemed like a limitless possibilities of radically transforming everything was within our reach: that people could, and would, come together to do things with radically new models, and that the world would be a manifestly better place for this change. As the Free/Open Source Software movement came into my vision, I discovered some other strands, all of which were inspired by this new technology of the Web, and all of which realigned my understanding of how things could change. Standard copyright law says: if you create something, you own the copyright; if anyone wants to use it, for whatever reason, they’ve got to contact you and work out the details of how they can use it, for how long, and how much they will pay you. But the digital world seemed to call for something else — people borrowed and built on others’ work all the time online, and a copyright scheme that makes this common practice illegal by default didn’t seem to make sense. 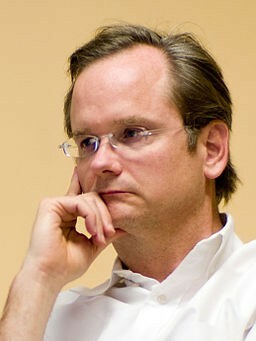 Creative Commons is Larry Lessig’s gift to the world, an effort to give a clear and standard legal framework for those creating things who want to share them under more permissive licenses than the norm in copyright law. This seemed to me a fundamental requirement for a new kind of Web-based innovation, where the overhead for building new things — new ideas, new art, new resources, new products — was reduced. Making wonderful things is hard enough, without the added administrative overhead of having to contact everyone whose ideas or art you are building upon, and negotiating a price and terms to do that building of something new. And this of course is the principle behind the Free/Open Source Software movement: we need to build new things all the time. This is how innovation happens. This is how we solve problems. The Free Software movement said, roughly: if you are trying to solve a new problem, then you shouldn’t have to reinvent the wheel. You should be able to use the components that other people have built, and build on that to build your own solution. The Free Software movement enshrined a right to stand on the shoulders of giants. We have so, so many problems to solve, and at a conceptual level, as a society, you want the raw materials for problem solving to be as easy for as many people to get their hands on as possible. Free/Open Source Software and Creative Commons built legal frameworks so that we can live in a society where ideas and tools are easier, rather than harder, to put together and use. There was another innovation, or rather, another articulation around this time, what was coined as “Web 2.0,” and broadly meant: a Web that anyone could easily publish to without any particular technical expertise. This was the Web that brought us easy blogging platforms, easy photo sharing platforms, video sharing services, a giant, free encyclopedia anyone can edit. And podcasting. While I had been intellectually excited by the concepts of Open Source and Creative Commons, Web2.0 was something different because it was, suddenly, something no longer theoretical for me. It was real. Even I could publish my thoughts to the Web. And I could find, and read other, similarly inspired writers — we once called them bloggers — online. These were voices impossible to find in the Globe and Mail or New York Times, or Mother Jones for that matter, writing about the things that interested me deeply. Often writing about how this new breed of Web technology could enable new kinds of collaborations, new kinds of access to knowledge, democratization of media. A brave new world. These new tools allowed us to write about, read about, and explore the implications of these very same new tools. These ideas about collaboration, regular people “writing to the Web”, open copyright licenses, were most concretely represented to me in that wild and crazy project that was and is Wikipedia. I remember when I first heard about Wikipedia and went to look at it. I didn’t quite “get” it. I understood the concept, but when I looked something up, and found nothing, … it just seemed like a strange kind of project. How will these holes ever get filled in? At some point, however, between a few different projects, I took a job with a friend of mine, who was developing museum exhibits. We were doing a big exhibit on dinosaurs for the Canadian Museum of Nature. I was tasked with writing up various parts of the exhibit. I knew nothing, not one thing, about dinosaurs, but armed with an Internet connection and a computer I started poking around … and finding more often than not that Wikipedia was a starting point for what I would write. From Wikipedia I would get a kind of overview, and then wander off to other parts of the Web to find more resources, verify facts. I guess this was my “oh, I get it” moment. As I was relying on Wikipedia, it seemed I should give back. 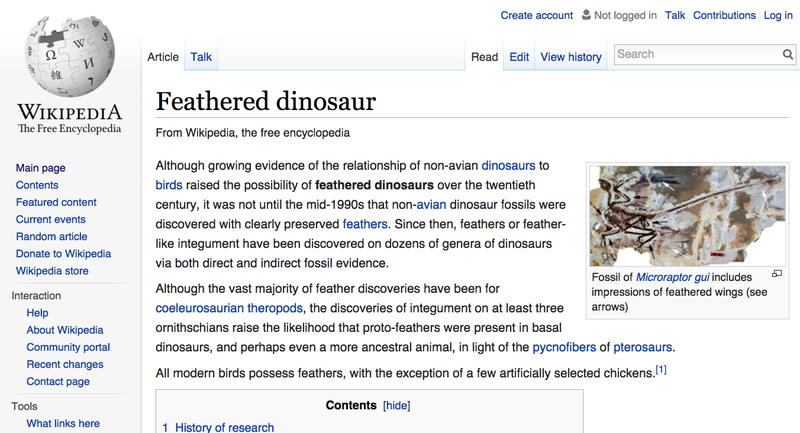 And so, I added the first substance to the Wikipedia article on Feathered Dinosaurs. The Wikipedia article on “Feathered dinosaurs”, the original version of which I wrote in 2004. This revealed to me how fundamental this shift was. While I was not a particular expert on dinosaurs, I had done enough research to know some useful things that weren’t reflected in the Wikipedia article. And so over a week or two, I started crafting that article, and adding to it, improving it. And here was the thing: It was easy for me to contribute to the public discourse not just my opinions about technology on a blog — which is of subjective value to the world — but also to contribute to a fundamental, public resource of knowledge about the world, to contribute “facts” to this resource that have a kind of inherent, objective value. Facts that anyone in the world can access for free. I started to think of this knowledge, in platforms like Wikipedia, as a public utility which would reduce friction to innovation and solving the world’s problems. There was one last thing that demonstrated to me the power of this new world of the Web, and that was podcasting. I love radio — I’ve long been a fan of the kind of programs you can only find on public radio. At the time for me that meant a few shows I could listen to on CBC, and a few on NPR. But podcasting — that changed everything. I could get stuff from Australia National Radio, and BBC, and from the Podchef who made a podcast about cooking, and a guy named Bicyclemark, who made a little left-wing podcast about the news and his reflections. It was through my interest in Podcasting that I stumbled on this blog post by theology prof and techno-evangelist, A.K.M. Adam (AKMA), who had gathered a group of volunteers together to make a podcast of Lawrence Lessig’s Free Culture, which I don’t think I had read yet. 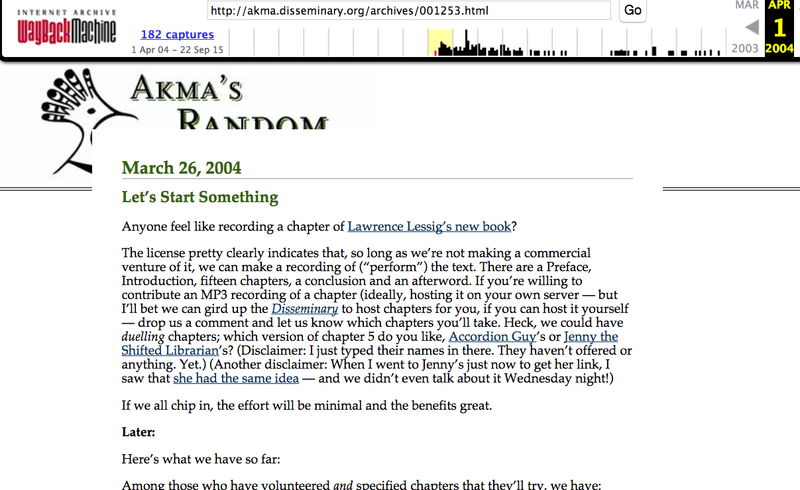 Original post on AKMA Adam’s Random Thoughts blog, calling for volunteers to help him record Lawrence Lessig’s “Free Culture.” (Pull from the Wayback Machine). The recordings were rough, and done by people using crappy microphones, with each chapter read by someone different. But the important thing was that it was there. The world was richer for that recording than without it. I was richer for having access to that recording. A few weeks later I was going to a friend’s wedding in the Gaspe, a six-hour drive from Montreal. I thought, I’d like to listen to an audiobook on the way, and since I was used to listening to podcasts, and had just listened to Free Culture, I figured there must be a big collection of volunteer-read audiobooks on Project Gutenberg, but there weren’t. So I poked around the Web and found a couple of people doing public domain audiobook podcasting, including Jan McLaughlin, of California, who had recorded the first 9 of 15 chapters of DH Lawrence’s Lady Chatterley’s Lover. So we listened to that on the way to the Gaspe, and got to the end of the nine chapters that she had produced … And that was it. Now I had to wait for Jan to finish the book to hear the rest of it! 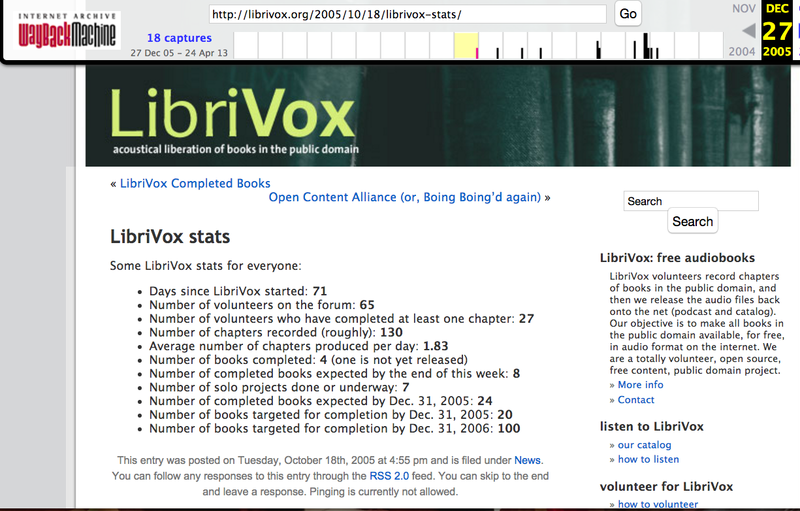 And so, in August 2005, with the idealism of those early days of Web2.0 I started LibriVox, not for money or any other reason than that I would like to live in a world where there was a huge, free, easy to access library of public domain audiobooks. There wasn’t such a library, but it seemed to me there should be. Here’s a picture from the Wayback Machine from October 18, 2005, less than two months after LibriVox started. Baby photos from LibriVox, age 3 months. Number of books targeted for completion Dec 2006: 100. By mid-December 2006 we were 50% beyond that target, with 150 completed books. We had close to a 1,000 volunteers toiling amazingly well. As of today, we have 9,150 books … From Jane Austen to Emile Zola. We have 36 languages represented, and 7,000+ volunteers (an interestingly low number of reading volunteers). We produce about 100 books a month, and those books have been downloaded some 500 million times. For free, all over the world. It’s worth stepping back and taking a look at how LibriVox books are made, to understand how LibriVox is a “publisher” that was shaped completely by the ideas I’ve been discussing above. Unlike Wikipedia, which has an open ended collaboration model, where an article is started, and anyone can contribute (either by adding, or deleting) … forever. A LibriVox book goes through various phases — someone posts about an audiobook they would like to make (say, Pride and Prejudice), and in so doing they become the “Book Coordinator,” the person responsible for husbanding that audiobook through to completion. Other people see that book, and then offer to help: someone will verify the copyright status (to make sure it is eligible for LibriVox), someone will offer to become the cataloger of the project (responsible for assuring all formatting of the files, and metadata is correct); others might offer to read one or 20 chapters; someone will offer to proof-listen, and perhaps edit the audio files. A volunteer might create some cover art. While LibriVox is an evolving organism, that year between 2005 and the end of 2006 saw a huge amount of work to figure out “how do we do this thing?” And we did it. This community of strangers came together to figure out how to publish audiobooks together, got to work. 3. (2006) Everything Is Awesome! So, the year is 2006. I’ve gone from beating my head against the wall trying to get a series of huge, complex, and powerful systems to move on climate change, and failing. I’ve watched in horror as the Twin Towers fell, and later as war started in Iraq. And then, one summer evening, from my little laptop in Montreal, I suggested that the world try to make free public domain audiobooks together. LibriVox bloomed. It was clear to me: The world was going to change, because the power of open, collaborative technologies. Because of the Web. Because so many people in the world would recognize that opening up information would spur innovation, good decisions, sound judgment. I had a sense of the “world as it is” … and the “world as we could reimagine and rebuild it” … using these new technologies. LibriVox was one of those accidental experiments that took off in ways I hadn’t quite expected. I saw something I thought the world (and I) would like to have, made a call out to the Web at large, and more quickly and more dramatically than I expected, it came to be. A few years later, I started thinking about trying to do something similar, but instead of audiobooks as the thing to be produced, I wanted to focus on original books. By this point my interest in “books” covered a range of problems, approaches and solutions that I found deeply exciting. Taking LibriVox as inspiration, I believed there was huge potential for global collaborative approaches to the production of (certain kinds of books). But more radically, I was inspired the idea of bringing books onto the Web, where they might be opened up, used and interrogated in new kinds of ways. I had a sort of revelation: why was it that we could do certain things with the information that was on the Web, but we couldn’t do those kinds of things with “books”? Clearly there was (and remains) reasons of business models. But business models aside, bringing books onto the Open Web opens up new opportunities to deliver value to readers, to connect ideas, to enable a more vibrant intellectual world. The possibilities are huge, and dizzying. If we start thinking of books not simply as “things we read” but “intellectual experiences we have,” then building on the (simple) reading experience could open up so much. All this was “clear” to me, and it seemed we needed somewhere to start: we needed simple tools to make creating books easy. 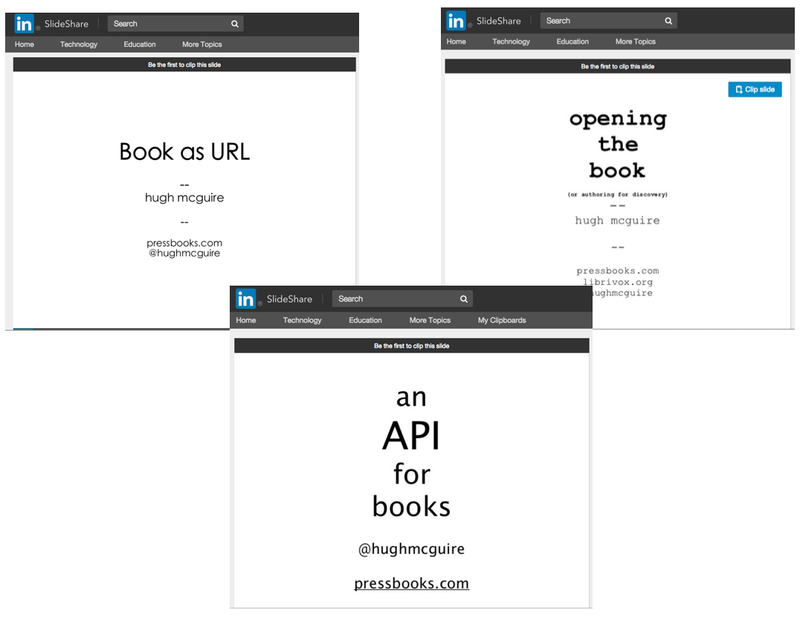 We also need tools that built “books” natively on the Open Web from the start. In 2011, Pressbooks was born, to address these two problems. While the obvious starting place for Pressbooks was to build an easy tool to that would let anyone make nice-looking books — PDFs for print, EPUBs, and MOBIs for Kindle — there was always a much more profound Trojan Horse built into Pressbooks. Every book was built as a structured Web object from the start, which meant not only could anyone make a book, but we could start dreaming about how the stuff inside of books might become full members of the open, connected Web (instead of locked inside of paper and ebook platforms). But, that early optimism about digital books, and even the Open Web, started to run up against the realities of a universe that seemed to be unfolding in less … idealistic … ways. 4. (2014) What Happened to the Awesome? IN 2011, I was filled with optimism about the Open Web. And I was filled with optimism that Pressbooks would help bring books onto the Open Web. Over the next few years, my optimism waned, painfully. It turned out that for most of the actual users of Pressbooks, the value of the software was almost exclusively that it made the process of making paper books and ebooks easier and cheaper than it used to be. That’s good, and I am happy for it, but the guiding principle behind Pressbooks wasn’t just to “make making books easier,” but rather to do so to enable new models of publishing to emerge, models that would be powered, I hoped, by the ideals of the Open Web. Like all idealists, I suppose I was doomed to be disappointed. What was possible in my idealistic world was not what was happening. Thus followed some lean years for us Web idealists, in a lot of ways. Much of the activity of the Open Web has been absorbed into closed platforms like Facebook. The vibrant early blogging ecosystem that first demonstrated to me the power of the Web for independent thought and activities got absorbed into big media companies, like Buzzfeed, the New York Times, and (yes) Medium. The kind of open collaboration that I expected back in 2006 morphed into something more closely aligned with older commercial models: first crowdsourcing, then the commodification of the “sharing economy” into services like Uber and Airbnb (both of which I use, neither of which is what I had in mind back in 2006). Finally, the Open Web became an environment driven largely by ad-based business models and technologies designed to track everything people do online, in order to better sell them other things. In the world of books, the great hope for many of us who saw in digital and ebooks such potential for new models, new kinds of connections between readers and writers, new possibilities for books to join the world as full members of the Web, have mostly been strangled in the past 7 or 8 years. The evolution of the “book” has been constricted by a combination of ebook platform vendor lockin (Amazon, Apple, Kobo, Nook, Google), DRM, and the general conservatism of the publishing industry. For some reason people in power with relatively well-functioning, if brittle, business models didn’t want to throw everything away on the Web if they didn’t have to! 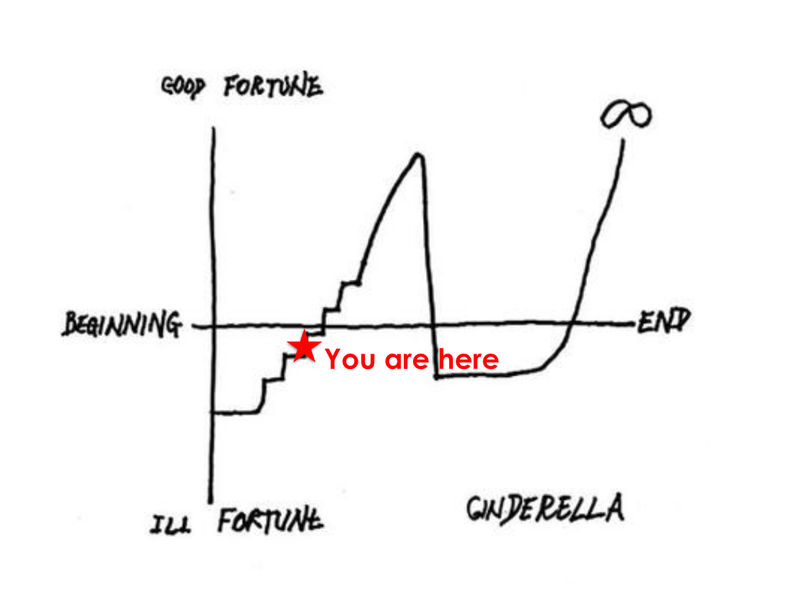 The optimism of the early days of Web2.0 was fading. The startup ecosystem and business models driving much of the Web were getting farther from what had inspired me back in 2006. Books were stuck in a crippled format, locked up in vendor silos that precluded innovation, and book publishers were generally happy to see the growth of digital plateauing such that business models could stay more or less as they had been for the past century or so. This isn’t the future I wanted. 5. (2015) Open Textbooks + Open Collaboration + Open Web = Optimism? This OpenEd movement posits that the basic building blocks we use to learn and expand scholarship should not be locked up in closed silos, should not restrict how we can use them. Should, in many cases, be free. In the OpenEd movement we have the seeds of a counter-counter revolution, a movement that has the power to reclaim and strengthen a corner of the Open Web, built on the ideals of open collaboration, open information, and critically, the OpenEd movements lets us think about building new ways of interacting with information. Textbooks might seem to be an archaic throwback, an outdated mode of information transfer. What we build on top of textbooks — the experiences we build around learning, whether teacher-to-student interactions, or new software and interactive tools for teaching — still need this base documentation to start from. David Wiley of Lumen Learning calls this “content as infrastructure,” and I love this phrasing. It captures both what is important about Open Textbooks as tools to build learning upon; but also hints at why Open Textbooks must be full members of the Open Web. The Open Web is the fundamental infrastructure for modern idea and knowledge sharing. In parallel, Open Textbooks must become the fundamental infrastructure for building education. They have the potential to radically transform education, access to education, and the relationship between students and what they are learning. Open Textbooks, and Open Education generally, have the potential to reanimate the Open Web, to carve out a vibrant corner where the old, somewhat faded ideals can be rejuvenated. The Web was invented as a document sharing tool, to facilitate exchange of research in academia. It has become something very different, a platform for commerce, discovery, lolcats, sharing and shopping of all kinds. But those ideals of the Open Web need to be reclaimed, and I believe the OpenEd/OpenTextbook movement can help make that happen. Textbooks are exactly the kind of resource the Open Web was built to distribute. But What about Commercial Textbook Publishers? There is a perfectly well-functioning model for commercial textbook production and dissemination. That’s good. But, like all traditional publishers, commercial textbook companies have constraints around business models, access, control that limit what they can do. The principles of the Open Web don’t translate well into business models where the product is a unit sale of information to an individual. The traditional textbook world cannot embrace the Open Web, because they don’t know how to. We are at the beginning of this Open Textbook movement. But I think Open Textbooks, and Open Education can help us those of us who are inspired by the Open Web to build for ourselves and the future a Cinderella Story. If any of this resonates with you, please get in touch. I’m starting something new with some great people, with my partner-in-crime Boris Anthony, helping to build out the infrastructure for Open Textbooks, and Open Webbooks, and we’d love your feedback. You can read a little more over at Reb.us, and if you like, you can sign up to our newsletter. (Thanks to Liz Mays and Brian O’Leary for comments on an earlier draft of this piece).